Within three weeks of the publication of On the Origin of Species by Charles Darwin, despite the immediate outrage it created among scholars and England’s powerful clergy, Darwin’s name was added to the list of men who would be knighted by Queen Victoria. History shows that this was an honor he was never to receive. 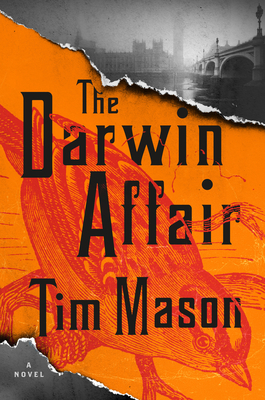 Tim Mason’s debut novel, The Darwin Affair, takes the reader back to that time, and, through a London police inspector named Charles Field---a real-life policemen whom Charles Dickens immortalized as the inspiration for Inspector Bucket in his novel Bleak House—tells us the story of how forces conspired to keep Darwin and the Queen apart. Cleverly combining historical figures with an original cast of fictional ne’er-do-wells, Mason weaves a richly atmospheric detective story that features the Chorister, one of the most diabolical and eccentric literary villains ever created. Fast-paced and filled with twists and turns, The Darwin Affair is a treat for all mystery and thriller fans, and marks the arrival of a distinctively inventive writer. Get ready for an exhilarating experience as the story gallops, steams, and roars from London to Germany and back, taking readers on an exciting ride into a dark but momentous era, accompanied by some of the most fascinating characters fiction—and real life--has ever produced. Tim Mason is a playwright whose work has been produced in New York and throughout the world. Among the awards he has received are a Kennedy Center Award, the Hollywood Drama-Logue Award, a fellowship from the National Endowment for the Arts, and a Rockefeller Foundation grant. In addition to his dramatic plays, he wrote the book for Dr. Seuss’s How the Grinch Stole Christmas! The Musical, which had two seasons on Broadway and tours nationally every year. He is the author of the young adult novel The Last Synapsid. The Darwin Affair is his first adult novel.